NB. It is permitted to fast these six days separately throughout the month, or consecutively, after Eid al-Fitr. It is prohibitively disliked (makruh tahrimi) and sinful to fast on Eid day itself. Can we observe the 6 fasts of Shawwal later in the year? I am aware that the Hadith says if one fasts in Ramadan and 6 more in Shawwal, one receives the reward of fasting the entire year as 36 fasts will be multiplied by Allah Ta’ala 10 fold which then equals 365. My question is: that Allah Ta’ala has promised (in Surah: Al-An’am, Ayah: 160) to multiply the rewards of all deeds by at least ten. This is general and so it applies throughout the year. Hence if someone observes six more fasts in any other month besides Shawwal, he should be attaining the reward of those additional sixty days too. So why does the Hadith specify the month of Shawwal for these additional fasts? Indeed Allah Ta’ala will multiply the reward of fasting in any month by at least 10. However, with regards to the specific fast of Shawwal, Imam ‘Abdullah ibnul Mubarak (rahimahullah) has said that one who observes the Shawwal fast will receive the reward of observing the Fard fast for the whole year! So those who fast the additional six fasts in Shawwal specifically, will actually receive the reward of observing the Fard fast for the entire year! Through this Allah Ta’ala has blessed the ummah by ordaining the fast of 30 day only, but they can achieve the reward of 365 days of obligatory fast! ‘Allamah Nawawi (rahimahullah) has cited the grand scholar of the Shafi’i madhab; Imamul Haramayn Al-Juwayni (rahimahullah) to have quoted from certain ‘Ulama that the reward of a fardh act is actually equal to 70 nafl (voluntary) deeds!! If one missed the six fasts of Shawwal, the reward of fasting the entire year can still be achieved if one fasts the six additional fasts in any other month after Shawwal. Since every act is rewarded tenfold. However, in this case, the six extra fasts will yield the reward of sixty nafl (voluntary) fasts & not the reward of the mandatory fast. Mulla ‘Ali Qari (rahimahullah) and others, also concur with this explanation. If one misses out the 6 fasts of Shawwal, one may offer these fasts during any other time of the year, although the reward will differ as explained above. See more details on this here. As Ramadhan departs, we all are encouraged to extend the momentum by observing the six fasts of Shawwal. The Commentators have explained that since every deed is multiplied ten times, by fasting in Ramadhan we are actually rewarded for 300 days and not just the 30 in Ramadhan. Therefore if we follow that up with six more we will be rewarded for sixty thereby attaining the reward of fasting for 360 days. 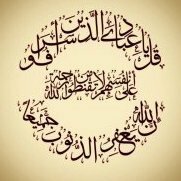 The question arises: The promise of Allah Ta’ala (in Surah: Al-An’am, Ayah: 160) to multiply the rewards of all deeds by at least ten applies throughout the year. Hence if someone observes six more fasts in any other month besides Shawwal, he should be attaining the reward of those additional sixty days too. So why does the hadith specify the month of Shawwal for these additional fasts? The general hadith commentators have said that the reason for this is (1) so that a muslim does not delay in accruing this grand reward. (2) Another reason is that it is indeed easier for people to fast these six days immediately after Ramadhan. (3) Some have said that these fasts are to make up for the deficiencies in our Ramadhan fasts. Some Scholars have actually given a different perspective to this. So those who fast the additional six fasts in Shawwal specifically, will actually receive the reward of observing the Fardh fast for the entire year! Through this Allah Ta’ala has blessed the ummah by ordaining the fast of 30 day only, but they can achieve the reward of 365 days of obligatory fast! ‘Allamah Nawawi (rahimahullah) has cited the grand scholar of the Shafi’i madhab; Imamul Haramain Al-Juwaini (rahimahullah) to have quoted from certain ‘Ulama that the reward of a fardh act is actually equal to 70 nafl (voluntary) deeds!! Consolation for those who miss the fast in Shawwal. It is Mustahab and highly rewarding to observe the six fasts of Shawwaal. The observance of these fasts has been emphasised by Rasulullah Sallallahu Alayhi wa Sallam in several Ahadith. It is the infinite mercy of Allah Ta'ala, that in exchange for minimal effort, he accords maximum reward. These fasts may be kept consecutively or at intervals during the month of Shawwaal. Women with Qadha fasts MUST keep their Qadha fasts first before keeping the Shawwaal fasts. The prohibition of fasting on the three days of Tashreeq (three days after Eid ul Adha-11-12-13 of Zul-Hijjah) refers to fasting three days after Eid ul Adha (the tenth of Zul-Hijjah). It does not refer to fasting three days after Eid ul Fitr (the first of Shawwal). Hence, it is permissible to fast immediately after Eid ul Fitr (the first of Shawwal) even if it is three days after Eid ul Fitr (the first of Shawwal). What is status of this hadith ? and what is status of its narrator سَعْدُ بْنُ سَعِيدِ بْنِ قَيْسٍ ? Is he reliable ? This Hadith is recorded in Sahih Muslim and is therefore authentic. The narrator you question; Sa’d ibn Sa’id ibn Qays (rahimahullah), has been declared reliable by several Hadith masters, namely: Ibn Ma’in -in one narration-, Ibn Sa’d, Daraqutni, Ibn Shahin, Ibn Hibban, Ibn ‘Adiy and others. A few Scholars have regarded him lower than his illustrious brother, Imam Yahya ibn Sa’id Al-Ansari (rahimahumallah) which is perfectly understandable. This however, doesn’t necessitate Sa’d being weak per say. All it means is that he is not as his brother is. Furthermore, there are six other reliable narrators who also report this from the same teacher as Sa’d’s. This further strengthens the chain and proves that Sa’d didn’t falter. Therefore Imam Muslim (rahimahullah) accepted this Hadith. This illustrates that the virtue of the six fasts of Shawwal is proven beyond doubt. Therefore one should not be moved by the baseless objections that some contemporaries raise against this Hadith. Is it true the Hadith regarding 6 days of shawwal fasting has a weak narrator and some of the ulama said fasting 6 days of shawwal is makruh? What you have heard is incorrect. ‘Allamah Qasim ibn Qutlubugha (rahimahullah) has rebutted those who claimed this fast to be makruh in his booklet entitled: ‘Tahrirul Aqwal fi Sawmis Sitti min Shawwal’. 1) Sayyiduna Abu Ayyub Al-Ansari (radiyallahu’anhu) in Sahih Muslim, Musannaf ibn Abi Shaybah, Hadith: 9816, Sahih Ibn Khuzaymah, Hadith: 2114 & Sahih Ibn Hibban; Al Ihsan, Hadith: 3634. 2) Sayyiduna Thawban (radiyallahu’anhu) in Sunan Ibn Majah, hadith: 1715, Musnad Ahmad, vol.5 pg.280 , Sahih Ibn Khuzaymah, hadith: 2115 & Sahih Ibn Hibban; Al Ihsan, Hadith: 3635. 3) Sayyiduna Shaddad ibn Aws (radiyallahu’anhu) in kitabul ‘ilal of ibn Abi Hatim, Hadith: 745. Ibn Abi Hatim then quotes his esteemed father, Abu Hatim (rahimahumallah) to have declared this narration as authentic. 4) Sayyiduna Jabir (radiyallahu’anhu) in Musnad Ahmad, vol.3 pg.308 & Sunanul Kubra of Bayhaqi, vol.4 pg.292. For further details see the booklet of Shaykh Khalil, Mulla Khatir (may Allah protect him) entitled: ‘Mashru’iyyatu Siyami sittim min Shawwal’. In addition to the above, several Muhaddithun have compiled the numerous chains of this Hadith in dedicated booklets. Q: Can I keep the six fasts of shawaal with the niyyat of qadha as well? Is it true that, besides Ramadaan fasts niyyat has to be made before subah saadiq? A: 1) Both have to be done separately. By keeping the qaza you will not get the thawaab of the six nafl rozas. 2) The niyyat for nafl rozas can be made after subuh saadiq as well, as long as one has not eaten after subuh saadiq. Q&A: Can I keep the six fasts for Shawwal even if I have missed fasts to make up? The six nafl fasts of the month of shawaal. If I intend to keep these fasts am I supposed to offer these fasts in a row (that is consequently) or can I take some gap in between, like one day I keep fast then after 2 or 3 days another fast like this. What is the fazilat of keeping these fasts. Ulama have explained these rewards by saying that every good deed is rewarded with 10 hasanaat (rewards), hence fasting 30 days of month of Ramadhan will amount to 300 rewards (30 x 10). Thereafter if a person fasts an additional 6 fasts, then this will attain 60 rewards him (6 x 10). 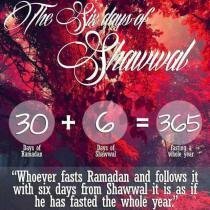 300 rewards from Ramadhan plus the 60 rewards from shawal adds up to 360, which is the total number of days of a lunar year. Hence a person collects the reward of an entire year. While the virtue of these fasts may not be mere numbers, nontheless their certainty is not hidden. a. Since a person is already in a habbit of fasting for Ramadhan, he may trivialize these fasts and keep them just as a second nature instead of revering them. b. A person can arrange his fasts to match the mondays and thursdays and include the intention of sunnah fasts as well.This can become a motivation to keep sunnah fast all year round. c. Some people keep them right after Ramadhan from the following day of Eid. This tends to jeopardise people who wish to come and visit late for eid due to one reason or the other, and have to face the awkwardness of their host fasting. Alternatively, the host may end up breaking the fast for his guests. Either way the optimum will have to be compromised. However, if someone feels that they will not be able to keep the fasts if they separate them, or if they delay it after Eid they may end up not fasting at all, then there is nothing wrong in fasting these days consecutively right after Eid as well. Being in the habit of fasting after the fasts of Ramadhaan is a sign of acceptance of the Ramadhaan fasts. This is because when Allah Ta’ala accepts a deed from a servant, he enables him to follow it with a good deed.